It’s been called the world’s healthiest food. So what is it that makes it brown in the first place? It’s actually the processing. The brown color comes from parts of the rice remaining in place instead of being stripped away like they are in white rice. Less processing adds to the health benefits of brown rice as well. Brown rice is the whole grain version. It still has the bran, and the germ along with the endosperm. White rice is endosperm only. The bran and the germ are the most nutritious portions of the rice grain. That makes brown rice far more healthy than its lighter colored, more processed white rice version. Is it Better than White Rice? In a word, YES! It has three times as much Vitamin B3, five times more Vitamin B1, almost 10 times more Vitamin B6. It’s also got twice as much manganese, phosphorous, and iron. These are all essential nutrients needed by the human body. In fact, white rice is enriched to add back in the B1, B3, and iron lost in the processing. Seems silly when you see it like that, no? It also offers four times as much fiber. In 100 grams of brown rice you can get almost two grams of fiber, but only about half a gram of it from white rice. 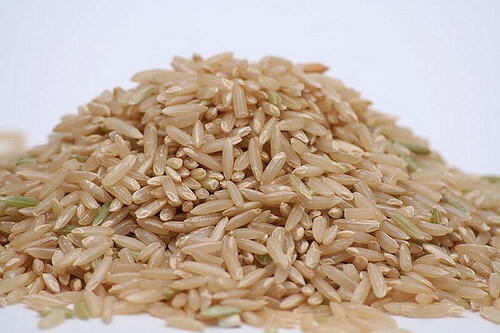 Other health benefits of brown rice include its manganese, magnesium, selenium, copper, and zinc contents. The human body needs all of these in trace amounts as we’ll talk about below. Manganese is an antioxidant for starters. It’s also an energy maker because it helps cut up protein and carbohydrates. It’s used in various systems and functions in the body like fatty acids, cholesterol, and in mitochondria where it helps stop free radical damage. Manganese is also a pretty important element to say the very least. In regards to magnesium, it helps with heart, muscle, and nerve functions. It also helps build strong bones, keeps you healthy in the immune system, and regulates blood glucose. One hundred grams of brown rice get you 11% of your daily necessary intake. Selenium is an antioxidant, and used in the heart and the brain. Copper makes blood red, well it makes red blood cells. It’s also found in the immune system, bones and connective tissues via collagen. And, it’s also an antioxidant. Zinc also has multiple uses in the body as well including immune system, cell growth, healing processes, and getting energy from carbohydrates. It also helps fight cancer. As stated earlier in the article, brown rice is high in magnesium. As it happens, fiber and magnesium have a big impact on blood sugar. Whole grains like brown rice can help lower blood sugar and decrease the potential to develop type 2 diabetes. This is partly due to brown rice increasing the blood sugar levels slower than white rice. Brown rice, by virtue of a plant compound known as lignans, helps protect against heart disease. There are numerous studies that show heart disease factors are lower for those with brown rice in their diets. And it’s not a small difference. Some studies reported 20% lower risk. Just two and a half servings of brown rice a week can lower the risk of heart disease by around 25%. This could be due to its part in lowering the bad cholesterol (LDL) and promoting the amount of good cholesterol (HDL) in the body. Various studies have shown correlation of positive health benefits of brown rice in women. It assists in maintaining a good, healthy body weight. Because of its high-fiber content, brown rice lowers weight gain. Another benefit is for postmenopausal women. Eating six servings of whole grains, brown rice or other whole grains, can fight off the effects of cardiovascular disease. That amount weekly is able to help stave off atherosclerosis. Yikes! That’s a big word. What it means is brown rice can help remove plaque build up in blood vessels. It also helps maintain artery diameter. Also in the long list of health benefits of brown rice, it helps protect against breast cancer for women who have not reached menopause yet. A cup or brown rice offers 3.5 grams of fiber roughly. The recommended daily intake of whole grain fiber is 13 grams, so about 25% in a single cup of brown rice. Almost unbelievably, brown rice also helps prevent gallstones. Alright, if you know how and why gallstones form, you might not be so awestruck by this statement. One of the health benefits of brown rice is its highly insoluble fiber, which has been linked to lower instance of gallstones in women through several studies. It’s a complex hypothesis but it has to do with how fast it moves through the intestines, and where it goes from there. There have been some studies that have shown there are health benefits of brown rice for children. When whole grains, like brown rice, are coupled with fish, it can reduce childhood asthma by 50%. Wheezing was also reduced from 20% to just 4.2% when brown rice and fish were part of a child’s diet. The asthma number drops from 16.7% down to just 2.8%. Does Brown Rice Have any Drawbacks? There are a few, small things that are not good about brown rice. For example, it is generally higher in phytic acid. While small amounts of this are good for the body, in larger amounts it prevents the body from absorbing iron and zinc. That means don’t eat brown rice three times a day, every day. Have a varied diet that includes a lot of other nutritious foods. It can also have more arsenic in it, depending on the growing environment and the local pollution. Arsenic can, over long-term exposure, be a cause of cancer, diabetes type 2, and heart disease. Again, stick to only a couple servings a week and you’ll be fine. Cooking food can sap the nutrients from it and they can be lost making the food less effective. To keep the health benefits of brown rice intact there are a couple good ways to cook it. Brown rice should be rinsed thoroughly before cooking. This is to get rid of any unwanted substances like dirt or remnants from the processing. Once it is rinsed, get it and water to boiling while uncovered on high heat. Roughly 1.5 cups of water for every cup of brown rice. Cover it with a lid and drop the heat to low to let the brown rice simmer for around 20 minutes. After that turn off the heat altogether, and keep covered for another 10 to 20 minutes. At the ten minute mark it will be a bit chewy, at the twenty minute mark it will be a bit mushier. Carefully remove the lid as there will be steam that needs to escape. The best way to cook brown rice is in a rice cooker. It’s not the only way, but is it essential for a quick, easy cook. Even a simple rice cooker can make it in around a half hour. The fancier rice cookers out there might even have an actual brown rice setting. These settings can take up to an hour and a half. That’s a long time to wait for rice to cook in a rice cooker. Using just a simple pot and lid, like above, the rice is done in under an hour. If you’re looking for the absolute perfect cook on your brown rice, you’ll want to go with the expensive, fancy rice cooker. If you want the quick easy cook, then go with a simple $30 rice cooker and you’ll be fine. For those who are more ambitious and like to experiment, try different times on your cooking with a pot and lid. One could even go up to 30 minutes of steaming after the heat is turned off and may even get a stickier, mushier rice. But the cooking instructions above for stove top are quickest. You might not be all that keen on brown rice. So here are a couple ways to make it more interesting aside from just throwing it in a sauce. Make Rice Pudding – Cooked brown rice with milk (almond, soy, or cow) and some raisins, honey and maybe a couple spices like cinnamon. Make Sushi – Cook the rice til sticky, get some nori, and some veggies and start rolling. Quick Sandwich – Even if your brown rice is cold you can make a quick sandwich or wrap with a flatbread, pita or tortilla. Add in some veggies, and/or chicken and maybe a little bit of a healthy sauce as a condiment. There are many health benefits of brown rice. But you might get bored of eating it. That’s why being creative with it is a great way to go. You can even throw brown rice on salads or add beans and hot sauce on tortillas for a spicier, southwest style meal. Keep thinking of new ways to eat it and you’ll benefit from it over the long run.